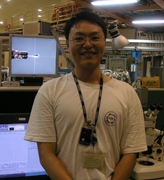 Cheng-Hung Chiang and Yuch-Cheng Jean, "Installation & Alignment Procedure of DCM’s Crystals Used at SPXF BL13B Beamline", NSRRC Technical Report (2006). Cheng-Hung Chiang and Yuch-Cheng Jean, "Installation & Operation Procedure of Liquid Nitrogen Cryogenic System for DCM Used at SPXF BL13B Beamline", NSRRC Technical Report (2006). Cheng-Hung Chiang, Yu-Shan Huang, Chun-Hsiung Chao, and Yuch-Cheng Jean, "Installation & Operation Procedure of ADSC Q-315 CCD Detector", NSRRC Technical Report (2003).